Oral care is an important thing for kids to learn at an early age. We know that it’s much hard to learn new tricks as we get older, so showing kids how to keep their teeth and gums clean and healthy is important. The trick is that “adult” toothpastes aren’t necessarily appropriate or kid-friendly. That’s where Oral-B Stages and Crest Pro-Health FOR ME come in. These products provide kid- and tween-friendly products to help kids brush and floss. Oral-B® Stages, dentists’ #1 recommended toothbrush brand for children, not only has kid appeal but is specially designed to address children’s dentition, dexterity and development as they grow. Oral-B also offers kid-friendly Stages toothpaste to complement their brushing routine. Oral-B Stages is recommended by dentists, accepted by parents and preferred by kids. Crest and Oral-B Pro-Health FOR ME is the first and only complete line of oral care products for tweens (kids 8+) created to protect all the areas dentists check in kids including fighting cavities, strengthening teeth enamel and freshening their breath. The Pro-Health FOR ME line includes toothbrushes that are just the right size for older kids’ mouths, toothpaste and rinse flavors designed for tweens and floss picks that are easy to use – all in unique packaging that’s cool enough for tweens! With innovative designs, bright colors, and kid-friendly flavors, both Oral-B Stages and Crest Pro-Health FOR ME are design just for kids. While they look fun, the truest test for both of these products is whether or not they can help kids “get excited” about brushing their teeth. I think the flavor and the strength of the toothpaste is perfect! The fluoride rinse is not mediciney at all, and is refreshing. The toothbrush has a nice design, and I like the way the bristles feel in my mouth. They are not too hard, and they are angled, so your teeth get really clean. I like using the floss picks so much more than regular floss. The floss picks have a minty flavor and I found it easier to reach my back teeth, and get all the hard to reach places. Also, the design on the packages is really cool. Thank goodness they did not use a cartoon character! This product is truly for me, not a little kid, but still not an adult! 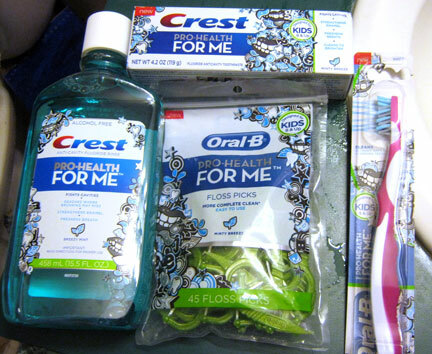 Both the Oral-B Stages products and the Crest Pro-Health FOR ME products were winners for our kid testers. Not only did the designs appeal to them, but the kid-friendly flavors and specially designed toothbrushes made the whole experience more enjoyable. To find the right toothcare product for your child, you can find Oral-B Stages and Crest Pro-Health FOR ME products at your local food, drug and mass merchandise stores. Prices range from $2.49 to $4.59 depending on the product. One winner will receive a collection of Oral-B Stages products and one winner will receive a collection of Crest Pro-Health FOR ME products. Leave a comment sharing which prize you would like to win (Oral-B Stages or Crest Pro-Health FOR ME) and why you like those products. +1 “Like” Oral-B on Facebook. +1 “Like” Crest on Facebook. +1 if you follow Oral-B on Twitter. +1 if you follow Crest on Twitter. Giveaway ends at 11:59 PM EST, September 9, 2011. Disclaimer: This post consists of my (and/or fellow tester) opinions only. Your experiences may be different. No compensation was given for this review/giveaway. WiC Chicks Hollie and Shelly did receive a free product from the manufacturer or their representing PR agency to use and test for the purposes of this review. This did not affect the outcome of this review. I would like the crest pro-health for me prize. I use the their products and they are really nice. I’d like to win the For Me level–my grand daughter is 9. I’d love to win Crest Pro Health For Me because I love the full mouth clean feeling that Crest products have on my teeth and gums! I would love the Crest Pro-Health FOR ME products. I’ve used Crest products and am a fan. I would like to get Crest Pro-Health For Me if I win. I would like to try the Crest Pro Health for me because I use Crest and like the clean feeling my teeth and mouth have after using it. I forgot to say why I would like these products. I have used Oral-B products for many years and my 2 kids used them. Now I trust these products for my granddaughter to use. Just teaching 4 year old how to brush teeth. It is so cute how he smiles while trying to brush his teeth with us! Id love the Crest Pro Health. Pro Health for me because my daughter is getting too old for the younger package and she would feel special knowing those products were just for her. I’d like to try the Oral B Stages for my 3 yr old daughter. She likes brushing her teeth and these products would make it even more fun. I’m a facebook fan of Crest under username Jennie Tilson. I’m a facebook fan of Oral-B under username Jennie Tilson. I’d like the crest pro health. Thanks! I would like to win the oral b stages because it is my kids favorite kind of toothpaste. I follow crest on twitter as kmayans. I follow oral b on twitter as kmayans. The Pro Health for Me for my ds16 because he’s wearing braces and can use all the cleaning help he can get. I’d like to win the Oral B stages for my granddaughter. My kids are completely on top of their oral care. In my house everyone takes care of their teeth, with the constant flossing, brushing & the use of mouthwash. I am a single mother and i spend hundreds of dollars a week foodshopping and i spend at least 30 dollars a week on oral care supplies, this would be one cost off of my load if i won this. It would mean the absolute world to me !!! I would love to win this .. Single mother. I spend at least 30 dollars a week on oral care & in my family we are all on top of our oral care. It would mean the world if i won, it would be one load off of my plate to take care of !! I would like the Crest Pro Health for Me. I would love to win the oral-b stages b/c it would be perfect for my kiddos! I would like to have the Crest Pro-Health FOR ME because I like to try new things! I follow the WiCProject on Twitter as HydeKayla. I would pick Crest Pro-Health for me because both me and my husband could enjoy it. I would like to win the Oral-B Stages because I have small children. I Like Oral-B on Facebook. I would choose the for me pack.. for my daughter! I would like to win the Crest Pro-Health for myself, because I have lots of problems with my teeth. Crest pro health for me please since I dont have kids young enough to benefit from the other packages. I would love to win the Crest Pro-Health FOR ME products because I like the fact its made for older children. 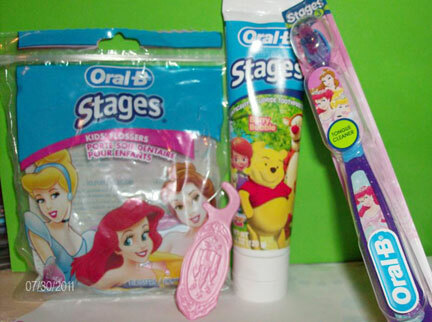 I love the Oral B stages for age 7 because they are tailored just for that age group and have the Disney characters to make it fun. for me, please!! cuz…well it ould be for ME!!! for once. I would love to win the Crest Pro Heath For Me products for both my teenage daughter and preteen son. It always a battle to keep them brushing and having products that are geared towards their age group might help motivate them more. I like Oral B on Facebook user Lisa Garner. I like Crest on Facebook user Lisa Garner. I’m following Oral B on Twitter @lisalmg. I’m following Crest on Twitter @lisalmg. I’m following you on GFC user WWillows6. I would choose the “Crest Pro-Health FOR ME” for my grandson & I like them because brushing alone with juste paste is not enough and this complete kit is a great way to get them to want to brush having there own kit,and Crest is a brand you can trust thanks! I would like the Crest Pro-Health FOR ME and I want to win them because I need better teeth.. I would choose the FOR ME package because the little ones seem to get so much encouragement to brush…I think it’s nice for the bigger ones to get that extra bit of incentive too. I like Oral-B on FB (Sarah Smile). I like Crest on FB (Sarah Smile). Me and my husband havn’t tried the “For ME” line yet, would be nice to get this gift as well. as well as a subscriber. long time Fan of WIC on FB, see my greeting! I would love to win the Crest for Me. We have the mouthwash and toothpaste, and my kids love it. I would like to try Crest Pro-Health FOR ME because I have yet to try this line. Would love to win the Crest Pro-Health FOR ME. My son is now using these and he feels so grown up. No longer like a little kid. He woudld a kick out of me winning these.